If ever anyone told you that you can’t do anything, what was your reaction? People have different responses to such a situation but personally I believe that sticking it to the person by definitively succeeding in that field which he said you couldn’t ever make into is the best reply. I’ve been that road oh so many times and let me tell you something: success is the best come back. Ever. So don’t listen all those people who tell you that learning how to tile is impossible or at least next to it. There is nothing in this world that would stop you if you really want to learn how. Of course, learning how to tile means setting aside some of the things you want or need to do because mastering a certain craft required a degree of sacrifice and attention. If you have nothing better to do and you feel like you can use the skill of tiling on a regular basis, read on and find out more! First of all, you have to have a good idea of what you want your bathroom to look like. You can just go in there and start tiling without having a mental idea of your end result. As such, when you start a tiling job for you bathroom, you should have a sit down with your family and discuss what type of tile design and color pattern you’d like. It is best to ask for feedback from the people who would be using the bathroom regularly, and it wouldn’t hurt to discuss it with them for who knows, they might have good ideas that are just waiting to be heard. After having laid out a foolproof plan, you should then proceed with the actual purchase of materials for the actual tile setting. Of course by this point you should have already read up on how to set tiles for your bathroom, so you would have a notion of what type of objects you need to buy from the hardware store. The important materials you need are the tiles, of course, and strong adhesive that is tile friendly. Accordingly, you would also need a measuring tape, a tile cutter, a notched trowel, grout and tole nippers. When you have all your materials and paraphernalia, there’s nothing left to it but to do it. But doing it requires measuring the bathroom area first, so you should do that with your measuring tape. After getting the dimensions, multiply the area with the number of tiles you bought and take note of any extra tiles/overlapping pieces with the wall. Your tile cutter will come in handy later on because it will cut off part of the extra tile and make sure your floor area is covered with just the right amount of tiles. 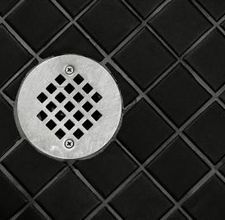 Before actually doing any work, however, you should make sure that your floor is clean and free from any types of dirt or cracks that might later on cause problems when the tiles are laid above them. After this, the actual tile laying can begin. 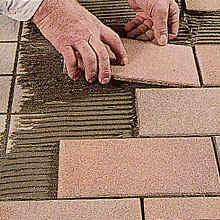 Mix the adhesive or mortar that you bought and lay them down on the floor along with the tile using the notched trowel. My contractor friends tell me that it is better to start at the edge of the bathroom away from the door because doing the opposite would trap you when you finish laying your tiles. Doing this would make you learn more about how to install tile flooring in the bathroom for future purposes. Make sure that you lay the tiles evenly. If a certain tile sticks out among the others, a gentle downwards push would suffice. Make sure that you don’t press down too hard because the adhesive might ooze out at the sides thereby ruining everything you have thus done so far. The same approach should be taken with the tiles that are cut with the tile cutter. Nippers, on the other hand, are for those areas with unusual shapes that tiles have to have. After leaving them overnight to dry, apply the grout in between the tiles to ensure there are no hollow points. You see, that wasn’t so bad wasn’t it? If I were you, I’d practice a bit first with smaller spaces before eventually going on to the bathroom. Maybe you’d want to tile your closet for practice or something. If you have hilarious tile laying stories or techniques on how to install ceramic tile flooring you’d like to share, leave a line on the comments section below to show your love. I can’t wait to hear from you guys.